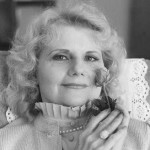 Cleo Virginia Andrews, better known as V. C. Andrews or Virginia C. Andrews, was an American novelist. She was born in Portsmouth, Virginia. Andrews died of breast cancer at the age of 63.